Rock Star Tri: My journey back to the endurance world frequently interrupted by life : Birthdays jumped the shark? It is birthday season. Last week was my sister's birthday and today is mine. 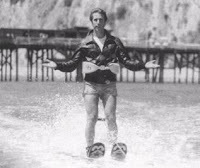 On Sunday I was having a discussion with my father regarding birthdays and I posed a question that I think is worthy of debate, "at what age did birthdays jump the shark?" The Urban dictionary defines jump the shark as "a term to describe a moment when something that was once great has reached a point where it will now decline in quality and popularity. Origin of this phrase comes from a Happy Days episode where the Fonz jumped a shark on waterskis. Thus was labeled the lowest point of the show." I am now 4 dozen years old (I've decided to take a stand on not saying 48 as that sounds too old) and I tried, as an academic exercise, to take a view of the concept of birthdays and birthday parties from the view of various ages. The typical 8 year old is much more excited about a birthday than a typical 28 year old (let along a 38, 4 dozen, 58, 68, 78 or more year old). The only people who look good in a birthday hat are either very young or very old. There may be a relationship to the amount of grown up teeth to the ability to pulling off wearing the pointy hat as a fashion statement. The pinnacle of birthdays seems to end with single digits although there are certain milestone birthdays (16 for girls, 18, 21, 65, etc) that have more gravitas. Four dozen isn't one of them though. Once you get to a certain age, I believe, birthdays return to the celebratory nature that they were when people were young. Don't know what this age is but it may be that it is more of a relief that the birthday party isn't some scene out of "Weekend at Bernie's." It may be your last one but then again, maybe not. A downside is that once you get to that age, whatever it may be, you might have a problem blowing out the candles. Or you might not even remember how old you are. In any case, I hope the cake still tastes as good then as it does now.